House walls, garden walls, fences, archways, pergolas, trellises, poles, either single or erected tripod fashion and other vertical or near-vertical features, provide the gardener with another dimension in which to grow plants. There are attractive plants available for this purpose, many of which benefit from the extra shelter provided by a wall or fence. Suitable plants include those which are true climbers, clinging to some form of support, either by tendrils (e.g. clematis), by twining stems (e.g. honeysuckles) and those known as self-clinging climbers, which adhere to their supports by aerial roots (e.g. the ivies) or by sucker-pads (e.g. the Virginian creeper and some of its relations). In addition to these true climbers, there are many woody or semi-woody plants which are not, in fact, climbers but may be trained against walls. Examples of these are the well-known chaenomeles (‘japonica’), climbing roses, ceanothus and certain cotoneasters. Self-clinging climbers need little in the way of extra support except in their early stages. Once started they cling to walls, fences and the like and need little more attention. Some gardeners are a little wary of the more vigorous self-clinging climbers such as ivies, but, provided they are not allowed to interfere with drain-pipes, guttering, roof tiles or slates, etc., they are unlikely to harm the wall itself. It can be argued that they help to keep the wall dry and the house warm, by providing a leafy covering which keeps off even the heaviest rain. Tendril climbers and twining climbers obviously need something to which to cling. In the open, garden poles, driven vertically into the ground or set tripod fashion, pergola posts and archways will provide support for twiners, but not for tendril climbers. These will need further support such as wire-netting placed loosely round the poles to which the tendrils can cling. The growths of non-climbers will need tying in to the support as they develop. Against walls and fences there are various ways of providing support for plants. Trellis-work is a well-tried method and panels may be bought in various sizes. Before they are fixed to the wall they should be treated with a copper naphthenate wood preservative to prolong their lives. Suitable trellis may also be made at home, using lathing, which is obtainable cheaply from builders’ merchants or timber merchants. It may be made to a square-mesh pattern or to the traditional diamond mesh. So that the growths of the climbing plants can attach themselves properly the trellis should be fixed 3-5cm (1-2in) away from the wall, using wooden distance pieces or spacers. Old cotton-reels are useful because they have a hole through which the fixing screw may pass. All fixing should be done firmly as eventually the mature plant may be quite heavy. Wall fixings such as Rawlplugs are admirable; an electric drill with a masonry bit is useful but not essential as the necessary fixing holes for the plugs can be made with a hammer and jumping bit. Where walls are painted or otherwise treated it is handy to arrange the trellis in such a manner that it can be easily taken down to enable the wall behind it to be painted. 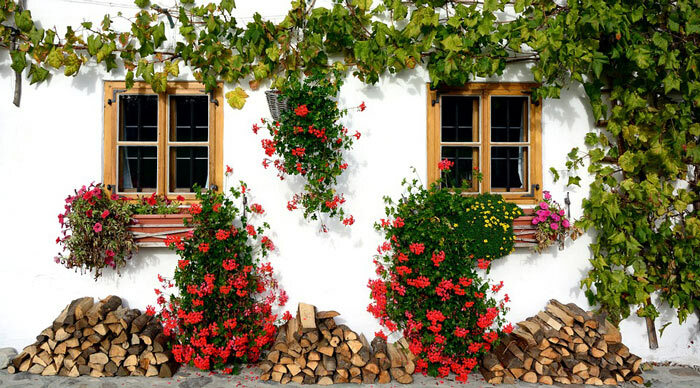 One way of doing this is to hinge the bottom of the trellis to a wooden bar of suitable dimensions fixed to the wall. The top of the trellis is fixed to a similar bar in such a way that it can be undone and the trellis and its plants gently lowered, thus minimising the risk of damage to the plants. Panels of plastic-covered, heavy gauge wire-netting (Gro-Mesh) are obtainable in various sizes, and these Provide excellent support for plants. They may be fixed to the wall in much the same way as wooden trellis. Wires, preferably covered, stretched across the face of a wall or fence, about 2.5cm (1 in) away from it, will also provide adequate support for many plants. However, unless the wire is properly strained it may sag in course of time. Vine eyes (drive-in pattern for walls, driven into the perpendicular jointing, screw-in type for wooden posts) are useful devices for fixing wires for climbing plants. Straining bolts, which can be tightened when necessary to take up any slack are also obtainable. Lead-headed wall nails, nails with flexible lead tags, are used for individual ties, when it becomes necessary to tie in long, woody growths such as those of climbing or rambler roses. An unusual way of growing certain climbers such as clematis, honeysuckles, is to let them clamber over dead trees or even up the trunks and into the branches of living trees. It is better to avoid for living trees the very vigorous climbers such as Polygonum baldschuanicum, the Russian vine, although this is perfectly suitable for a dead tree, which it will quickly smother with its long, twining growths. 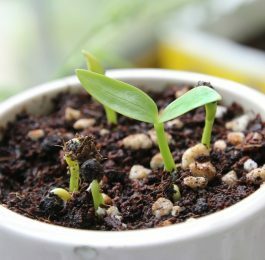 Some climbers may easily be grown in well-drained tubs or other large containers and this method is useful where there is no soil bed near the wall, or in courtyards, patios or on town balconies. John Innes potting compost is suitable but vigorous plants may need regular feeding when in full growth. 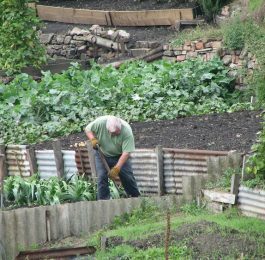 drained, and the opportunity should be taken to dig in a good supply of garden compost, well-rotted manure, leafmould, spent hops, and other bulky manures, plus about 110g (4oz) per square meter (yard) of bonemeal, well worked into the top 15cm (6in) or so of soil. Sites by walls present certain problems which are not always appreciated by gardeners. The soil in such places is often poor, full of builders’ rubble and other rubbish buried when the house was built. It is often dry, protected from rain by overhanging eaves. To ensure that the plants do well it is necessary to carry out considerable soil improvement. In some instances it may pay to remove the existing poor soil and rubble to a depth of a foot or so and replace it with good soil from elsewhere in the garden, adding quantities of rotted manure, compost, leafmould etc., all of which will not only provide plant foods but will also help the soil to retain moisture. Even so, in periods of drought, it may be necessary to water copiously, soaking the site from time to time. If the soil is replaced it should be allowed to settle for some weeks before planting is done. During this time the wall supports can be fixed in position. The footings of walls usually project beyond the line of the wall itself and to avoid these and the drier soil at the base of the wall, the plant should not be closer to the foot of the wall than 15cm (6in). Where there is enough room, a planting hole about 60cm (2ft) wide and 46-60cm (1 1/2 -2ft) deep should be taken out, to allow sufficient room for the roots to be spread out properly. If the soil is heavy clay it is better not to replace it but to use instead some specially made up planting soil. The basis of this might be old potting soil or good loam to which should be added generous quantities of garden compost and leafmould plus a couple of handfuls of bonemeal per barrow-load of the mixture to provide slow-acting food. to cut the ties, after the plant has been placed in position in a planting hole of suitable size, and pull away the sacking. If this is difficult it may be left in place as it will rot away .gradually and the roots will, in any case, grow through it into the soil beyond. Planting should be done firmly, returning a little soil round the roots first and working this in among them and firming it with the hands. More soil is then added and firmed with the boot, provided the roots are adequately covered, until the hole is filled. The soil-mark on the stem gives a guide to the correct depth to plant, although it is usually best to plant clematis a little deeper than is indicated by the soil-mark generally given. Some temporary support should be provided for the plants until their growths reach the wire, trellis or other support and can begin to cling or twine. Even though this is temporary it should be firmly fixed to prevent the growths blowing about and being damaged. Short canes, twiggy sticks, strings or wires fixed to pegs driven into the ground, are all suitable. Left to their own devices many climbers quickly become a tangled mass of growths, new shoots clinging to or twining round older ones, instead of neatly covering the supports provided and filling their allotted spaces. Some initial training may be needed to overcome this tendency. Such training consists in starting the new shoots off in the right direction and occasionally during the season ensuring that they are carrying on in the way they are desired to go. This is particularly necessary where it is required to train the shoots horizontally or nearly horizontally, since the natural growth of the plant is upward. Shrubs trained flat against walls and fences usually need to have their breast-wood removed from time to time. Very young growths developing from forward-pointing buds can often be rubbed out to prevent their development; otherwise the secateurs will have to be used judiciously. Pruning is often needed to keep plants under control or to ensure the production of new flowering growths. An annual mulch round the bases of the plants, but not actually touching the stems, will help to prevent the soil from drying out in hot weather, particularly near walls and fences, will keep down weeds and will supply plant foods and improve the soil texture as the mulch is gradually absorbed into the soil by the action of worms and weather. Such a mulch might consist of garden compost, leafmould, partially rotted leaves, or moist peat. Late spring is a suitable time to apply the mulch which should be fairly deep. The covering may be renewed from time to time during the summer if it shows signs of dispersal. Some slightly tender plants may be grown successfully against walls in many parts of the country although in severe weather some protection may be necessary. Bracken fronds may be sandwiched between two layers of wire-netting to make an excellent protection which can be placed round the plant when necessary. Wire-reinforced plastic material can be used to make a roll, stapled together along the edges. This roll can be used to surround the plant but should be fixed firmly to a stake to prevent wind movement. Hessian sacking may be draped over the plants in bad weather but should not be too close to them. In fact, no form of protection should surround the plant too closely and it should be removed as soon as possible to allow light and air to get at the plants again. Supports will need some attention from time to time as the plants grow and, for vigorous specimens, it may be necessary to provide further supports in the course of time. Many plants in full leaf present a good deal of wind resistance and inadequate supports, or those which have been weakened through age, may easily be brought down, possibly doing irreparable damage to the plants or at least undoing the work of some years. Any suspect supports should be replaced as quickly as possible. In time the plants will exhaust the plant food available in the soil, but before that time arrives some extra feeding will be necessary. Annual mulches will provide a good deal of food in time but spring and summer feeds with sulphate of ammonia, nitrate of soda, Nitro-chalk, all at about 25-50g (1-2oz) per square meter (yard), or proprietary fertilizers at rates recommended by the manufacturers, are quick stimulants. Over-feeding must be avoided; small doses given at regular intervals are much more effective than large doses given infrequently. Feeding should cease by the end of August to avoid the production of soft, frost-tender growth. Bonemeal stirred into the top soil at up to 115g (4oz) per square meter (yard) in the autumn or winter will release plant foods slowly during the following growing season and possibly for longer. There are a fair number of annual climbers which may be used to form quick screens if grown against appropriate supports. It almost goes without saying that the quickest results are obtained by growing the plants in rich soils and by feeding them with dilute liquid feeds at regular intervals once they are growing well. The exceptions are the climbing nasturtiums which tend to make foliage at the expense of flowers if grown in too rich a soil. However, even these do better if the soil is not too poor and dry. Deadheading will do much to keep the plants flowering instead of spending their energies on ripening seed. Some of these climbers may be grown from seed sown out of doors in spring where they are to flower, others give the best results if they are grown from seed sown in heat in the greenhouse. Some climbing plants growing along a fence appear almost to transform it into a hedge, and there is no doubt that in general terms a growing, living hedge is always more attractive as a garden boundary or division than the plain and somewhat stark surface of a fence or wall. There is a much wider selection of plants suitable for hedging than is generally realized and the gardener will be advised to spread his net wider than to choose the somewhat drab and greedy-rooted privet or the commonplace beech.